More than 66,000 children have already registered during the current academic year for Children’s Traffic Club (CTC) London, and Transport for London (TfL) is targeting 100,000 registrations before the end of the school year. Funded by TfL, CTC London is a road safety education programme provided free of charge to pre-school children and their parents and carers. The Club also promotes sustainable modes of transport such as walking, scooting and cycling. Every child who joins the Club receives a welcome pack containing fun characters, stickers, stories and songs. 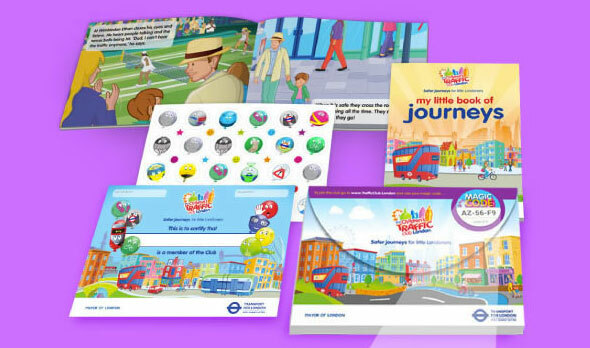 Each pack has a ‘Magic Code’, which unlocks interactive games, stories and songs on a website where children can track their journey using a fun route map. CTC London also includes a free app containing fun road safety and transport games to further help young Londoners to stay safe. CTC London has been running since 2003 and in that time more than 500,000 pre-school children have benefited from the programme. In the 2014-15 school year 90,000 children joined, and since September 2015, 66,542 children from 33 London boroughs have registered for the Club. TfL says its most recent research shows that 87% of parents or carers reported that their child is more aware of the importance of road safety as a result of CTC London. Leon Daniels, managing director of surface transport at TfL, said: “CTC London is a brilliant, fun and engaging way to educate pre-school children about the importance of staying safe on London’s roads. “That’s why we are funding this initiative for all London’s pre-school children, as we know how important early intervention is when helping young people to stay safe.